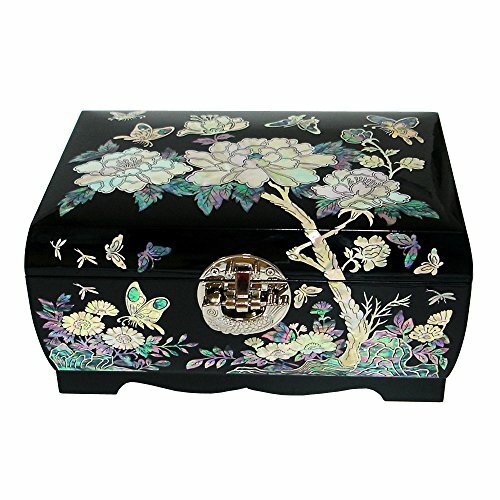 This exquisite wooden lock jewelry box is lavishly ornamented with mother of pearl peony flower painting. The elaborate adornment of the entire body (except for the back) makes it a breathtaking piece for storing personal fashion items. It is quite remarkable that the artist could depict the scene in such detail without brush nor pen, but only with mother of pearl strips. The fully open peony blossom is a symbol of wealth and nobility. The elegantly designed embroidery laid upon the inner bottom and traditional Korean fish lock give the beautiful panache to this jewelry box. The fish whose eyes remain open even while sleeping was a popular guard to keep vigil over personal treasure. The houseware coated with natural lacquer has long been used in East Asia for its glossy beauty as well as its practicality for being strong, watertight and antibacterial.